I was craving something tropical for lunch the other day, and looking in my fridge saw some leftover rotisserie chicken that needed to be used up. I debated on either creating a healthy wrap, a tasty, lightened up chicken salad sandwich, or a fruity chicken salad, and in the end, the salad won. 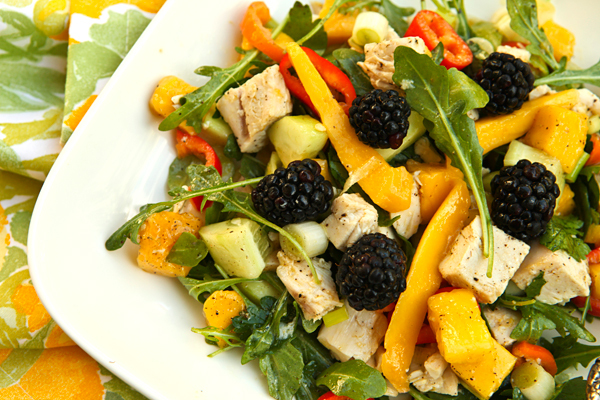 I mixed mango, onions, chicken, cucumbers, sweet peppers and some peppery arugula to create this salad which I dressed with a lime and ginger vinaigrette. You could use any greens of choice, but if choosing a larger lettuce variety such as romaine, I’d cut the lettuce into slivers to go along with the chopped ingredients. I garnished my salad with some big fat blackberries I had just picked up at our local green grocer, but toasted slivered almonds, or lightly toasted coconut flakes would be delicious as well. You can poach or grill chicken breasts for this recipe, or use a rotisserie chicken as I did, reserving the rest for another day. Do make sure your mango is nice and ripe for the best results. 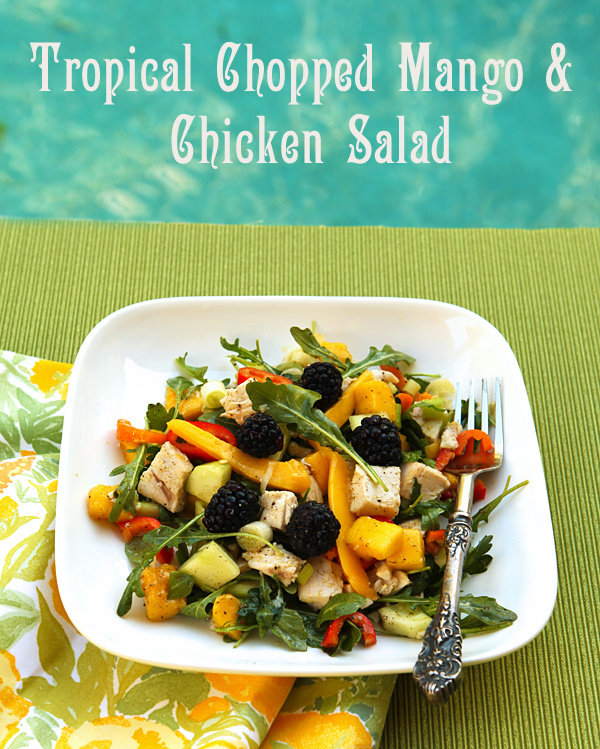 This salad is a complete meal on a plate, has lots of flavor and texture, and brings a feeling of the tropics into your kitchen no matter what the season may be. White breast meat is a lean source of protein. 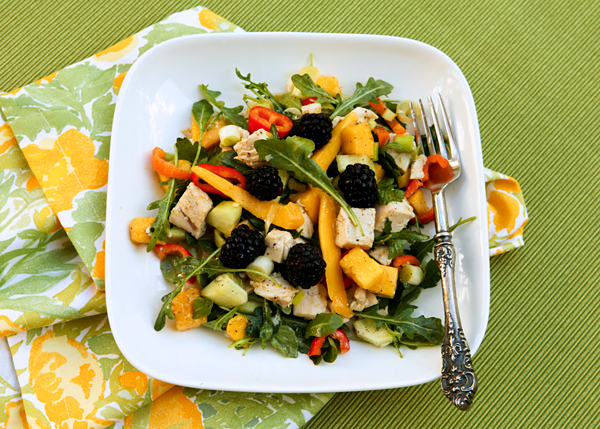 In a bowl, mix together the salad ingredients. Place the dressing ingredients in a small food processor or blender (or use an immersion blender) and blend until smooth. Taste, and adjust seasonings and oil and lime juice if needed. Drizzle half the dressing over the salad and toss. Taste, and add additional dressing if needed. Serve the salad on individual plates, with garnish of choice.